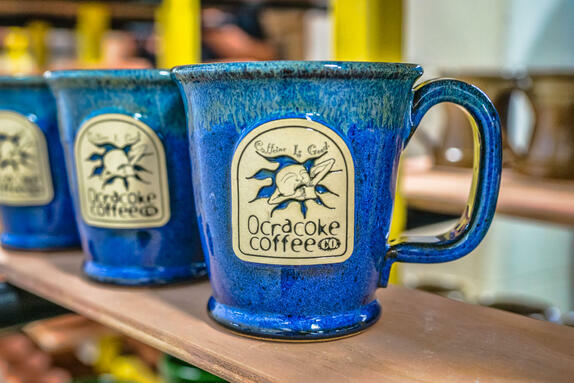 Sunset Hill Stoneware has dozens of mug styles to choose from for your coffee shop, and they can all have an impact on the vibe your company gives off. Whether you choose a curved style like the Potbelly or a more straight-lined mug like the Executive Slim, we have spent years developing mugs for nearly every story you want to tell for your brand, cause or customers. 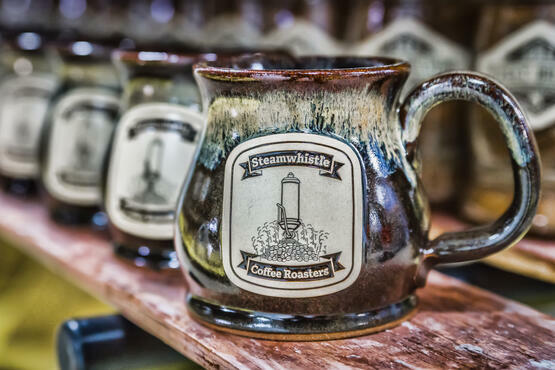 These three unique coffee mug styles and the rest of our 14 available mug styles are handmade by artisans in Neenah, Wisconsin. 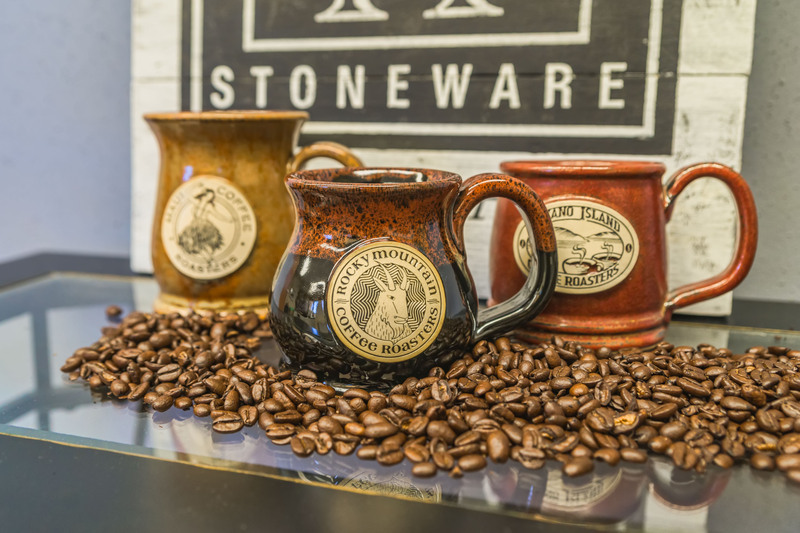 All of our stoneware is 100% lead-free and FDA and California Proposition 65 compliant, so you and your customers can enjoy every sip of fresh coffee with peace of mind. With its curved design, the Potbelly stands out in a crowd. Elegant yet down to earth, it's comforting to hold but looks sophisticated enough to be used in a variety of situations. It makes for ideal coffee shop merchandise, but is also perfect for customers who need a quick pick-me-up in the morning. Whether your coffee shop is in a seaside city, up in the mountains or in a small town in Middle America, the Potbelly is a distinctive but unpretentious head-turner, especially when paired with a glaze color that suits your shop's brand. The Potbelly holds 12 oz. 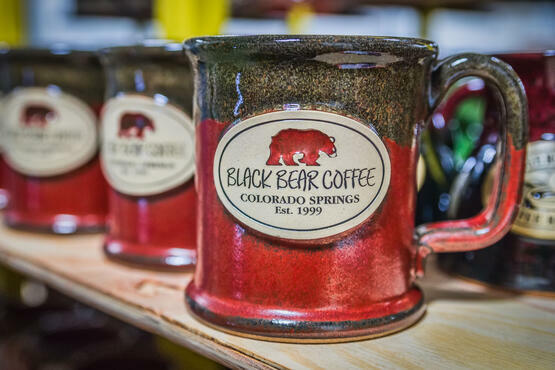 of liquid and stands at 3.625" tall, making it one of our smaller mug styles. In turn, it's also emblazoned with a smaller medallion than what you might find on its 16-oz. cousins. However, don't think that means we can't include the fine details of your artwork on the mug. Our art department can design medallions with lines almost too thin to feel under your fingertips for fine details and distressed patterns on logos. A classic, elegant shape helps define the Executive Slim for what it is. Its straight lines make it a versatile choice that can be branded with your logo as drinkware for your coffee shop, or as merchandising and gift options. The Executive Slim also makes a good choice for gifts if you have any direct relationships with corporate clients. Like the supermodel that it is, the Executive Slim looks good in just about any color. Some coffee shops prefer it in solid, single-colored glazes, but it'd also look good in a little two-toned number of your choice. The Executive Slim holds 14 oz. of coffee, tea or hot cocoa and is 4.25" tall, running in the middle of the pack. Square medallions or those with cornered edges tend to be popular choices on the Executive Slim because of its narrow shape, but round designs can also be used on the face of this beauty. With some glaze colors, you can even have the empty spaces of your medallion filled in with the glaze color for a dramatic effect against your logo. The Morning Rambler is a simple yet comforting design that's perfect for bringing a fresh cup of coffee on a sunrise stroll through the neighborhood. The sleek, contemporary design is a perfect statement piece for any coffee shop looking for gifts for die-hard fans or mug collectors. The funnel shape of the Morning Rambler is in a class all its own. If your coffee shop is located in a touristic area, it's the perfect opportunity to create a memorable piece of merchandise with a bold, broad medallion for anyone who comes in from out of town. Weighing in at 12 oz. and 4.375" tall, the Morning Rambler is a middleweight champion for any coffee or tea, whether it's plain black or a latte with honey. The Morning Rambler looks beautiful in just about any color, but many customers like to use two-tone glazes to highlight the mug's broader top. These are only three of our 14 different mug styles, let alone the stein styles we also have available. Each coffee shop is unique, so if you're looking for something that would suit your company even better, check out our style guide through the link below.